Charleston Landing is a luxury community of large custom built homes in Cherry Grove, about a mile from the beach. The homes surround the marsh and a beautiful lake, and residents have a pool and playground for the kids. Most of the homes here are 4 to 6 bedrooms, in the raised beach house style, and were built anywhere from 2004 to recently. Prices range from about $300k to over $500k, depending on lot or home size and lake views. Homesites are large and offer plenty of landscaped greenery, mature trees, and tropical foliage. There are many lots still available, from waterfront to inexpensive wooded sites, with no time limit on building. Lots start at around $60,000. Charleston Landing is a very exclusive community and the homes offer all the luxury appointments such as hardwood flooring, stainless steel appliances, granite countertops, trey ceilings, fireplaces, garages, and all the other upgrades that are expected. Children will attend North Myrtle Beach Elementary, Middle, and High Schools. If you'd like to see this amazing development, call us and take a tour. 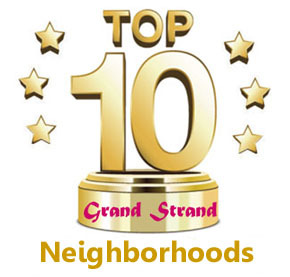 See what living in the Grand Strand is all about. Listing courtesy of RE/MAX Southern Shores NMB , Terry Parker. Listing courtesy of Hartland Properties , Rebecca Moses.